BBFC Consumer Advice:Mild violence, language, injury detail. The 24th of March 2019 marks the 75th anniversary of the real-life POW escape during World War II at the Luftwaffe-run Stalag Luft III prison in then German-occupied Poland. In honour of this, Dan Snow hosts a commemorative evening at the Eventim Apollo in London. 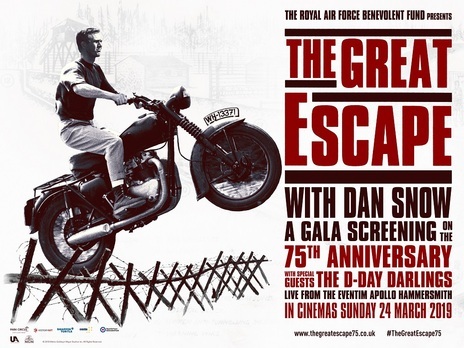 The event will be live broadcast as a pre-show across UK cinemas, followed by THE GREAT ESCAPE (1963). 6pm. Live Show Broadcast Via Satellite Into Cinemas.